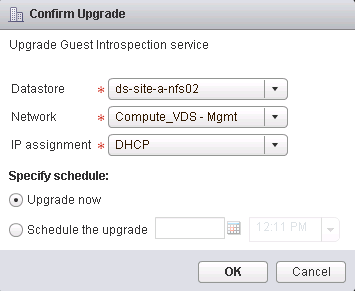 Log into the vSphere Web Client and navigate to Networking & Security -> Installation -> Service Deployments. Select the service deployment that you would like to upgrade, then click the green upgrade button. You will be given the option to Upgrade Now or Schedule the Upgrade. Select whichever option you would like, as well as the Datastore, Network and IP assignment then click OK.